A recent article in the New York Times provides a fascinating peek inside what could only be described as an evangelistic planning rally for scientism--the religion of Richard Dawkins, Sam Harris, and their ilk. Very entertaining reading, especially for anyone who has ever attended an evangelistic crusade (that is, about 1.2% of NYT readers!). But the article is also disheartening: is there any hope of people actually talking to one another in our polarized culture? Or are we doomed to live in tribalistic quadrants carved up by the polemic of talk radio, cynically preaching to our respective choirs? I just returned from a fabulous conference at the Katholieke Universiteit in Leuven, Belgium on "Augustine and Postmodernism: A New Alliance Against Modernity?" (9-11 November), hosted by Lieven Boeve and Tom Jacobs--who did a wonderful job both pulling together a stimulating team of scholars for this colloquium, and then providing unparalleled hospitality that nourished our conversations. Here are just a few pictures and reflections. 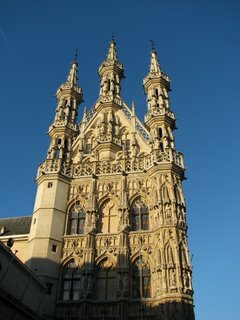 Leuven, a late medieval city in the Flemish part of Belgium, is a very short train ride from Brussels. The Katholieke Universiteit (Catholic University)--is a core feature of the town and students are everywhere. It is very much a "university city" and given its size and history, it reminded me of Cambridge in many ways. 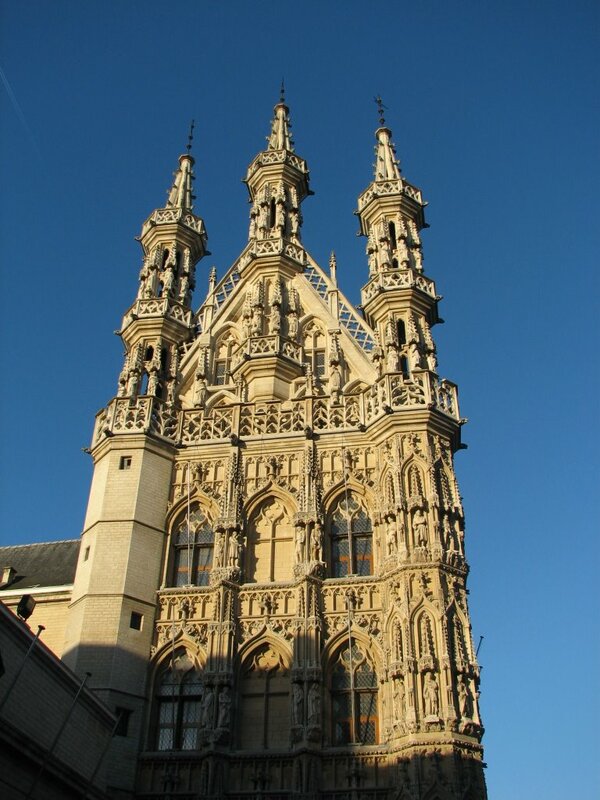 Pictured here is the famous Town Hall of Leuven, a quintessentially Gothic structure completed in 1468. Leuven's Faculties of Theology and Philosophy are internationally esteemed. The theology faculty made a mark on Vatican II (indeed, some of the conversations at our conference circled back to consider just what was at stake at the council and what it would mean to continue--or contest--that legacy) and has continued to generate important work, including recent engagements with postmodernity. The Institute of Philosophy is home to the Husserl Archives and has for decades been one of the premier influences on contemporary phenomenology. 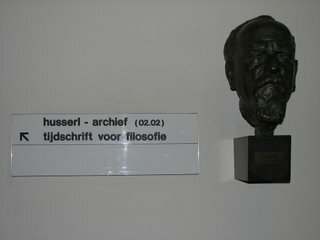 So it was a treat for me to make a bit of a 'pilgrimmage' to the Husserl Archives while I was there. An unanticipated treat was Belgian cuisine. Our hosts showed us a wonderful time in local establishments. While I came with high expectations for Belgian beer (I learned that Stella Artois constitutes the dregs of Belgian beer that they send to us in the America, saving the best stuff for themselves! ), I enjoyed several excellent dining experiences. These included a tantalizing pork dish (covered with Danish blue cheese) on Friday night, followed with a Saturday lunch of steak, peppercorn cream sauce, frites (which the Belgians, not the French, invented! ), and a glass of Duvel. This was topped off when I visited some new friends, the Micheners, on Saturday in the Wallonie (French-speaking) region of Belgium (just south of Leuven). There I enjoyed "raclette," which is both a kind of cheese and a mode of preparation: cheeses, meats, and vegetables prepared in a central table-top grill, then poured over Belgian potatoes and complemented by French wine. Yeah, the airline food the next day was, er, a bit of a step down from all that! The conference conversation--focused on the role that Augustine plays (should play, could play) in contemporary theology and, in particular, theological accounts of cultural engagement--was top-notch and stimulating. The conference was organized as what they described as an "expert colloquium"--a sort of closed-door roundtable discussion with a few folks listening in. Some of the other speakers including two of my former teachers (Robert Dodaro from the Augustinianum in Rome and Anthony Godzieba from Villanova) as well as folks like Fergus Kerr and Emmanuel Falque (from the Institut Catholique in Paris), and several very sharp younger scholars (including Holger Zaborowski). The proceedings of the conference will be published next year. But most importantly, the conversation--at times animated--really helped me to crystallize some of the key issues I need to think about as I'm trying to develop an Augustinian political phenomenology. One of the other delights of being in Belgium was getting to know the good folks at the Evangelical Theological Faculty on the south side of Leuven. Having briefly met Ron Michener once before, I enjoyed a morning of conversation with Ron, Patrick Nullens, Filip Cavel, and a couple of other doctoral students about the challenges and opportunities for evangelical theology in Europe. But Danforth's wishy-washy-ness helped to highlight (again) how much Jim Wallis is playing the same game as the Religious Right--they just disagree about specifics. While Wallis is as critical of the Religious Right as anyone--and the Right is clearly the target of Danforth's book--anyone who writes a book entitled God's Politics is working with the same tools. Wallis' constantianism of the left is (or should be) just as much a target of Danforth's critique as Dobson and Falwell. 2. And now, after the Democrat's (seeming) sweep of the mid-term elections, Jim Wallis is claiming that it was the Christian left who were the deciding factor in giving the Dems victory (see also Christianity Today's nice online piece, "Declaring Victory"). Wallis is still jealous, I guess, about all the press's causal claims about the role of the Religious Right in '04. But this evokes a couples responses. First: Really? But is there any data to support this claim? Exit poll questions were asking this? Methinks there's some serious over-estimation going on here, tied to a certain over-estimation of Wallis' own importance. Second, there is a remarkable irony about Wallis' posturing. At one point Wallis says this: "When Democrats can run authentically as persons of faith, they can beat back the idolatrous claims of the Religious Right that God is only on their side." This from a guy who has the audacity to write a book called God's Politics. I think the "only" in this quote is superfluous, and masks the fact that Wallis thinks that God is on his side. This morning, while trying to undo autumn's leafy deposits across the backyard, I found myself--much to my surprise--praying for Ted Haggard. To be sure, Haggard represents almost everything I loathe about the Religious Right and the Babylonian captivity of evangelicalism (captured so well in Jeff Sharlet's Harper's piece a while back). And news of these allegations has made leftist bloggers just downright giddy. But it's curious how this explosion in Haggard's life could be a reminder that, despite our political differences, Ted Haggard is still a brother. (And maybe this is a tiny little confirmation that, despite all my protests to the contrary, I'm still an evangelical.) Recent video of Haggard in his SUV, with his wife in the passenger seat, was one of the most painful snippets I've seen in a while. Forced to revise his story (I think common sense should tell us to expect further revisions), Haggard's tired eyes keep darting to his wife's face as he has to confess to compromises and failures (the camera's gaze is almost merciful in not showing her face). While sociologists are constantly looking for the defining features of "evangelicals," I wonder if the Haggard case might provide a more visceral criterion: if you see what Haggard and his family are going through, and are moved to consider their pain, and have a haunting but persistent sense that "there, but for the grace of God go I"--then you're an evangelical. Evangelicals in their best moments are painfully aware of the brokenness of our world, and of our very selves--even our redeemed selves. And thus struggle to answer the Spirit's call to "weep with those who weep" (Rom. 12:15). "Let him who thinks he stands take heed lest he fall" (1 Cor. 10:12). Brian Leiter, with whom I'm not often prone to agree, has an interesting post on "Why I am Not a Liberal"